One Way by S.J. Morden. Orbit, 2017. Paperback. 368 pages. Now this was a fun, fast-paced adventure that I found incredibly entertaining. I was immediately pulled in by the premise of this book and I'm happy to say that I felt it was executed really well. I've recently found that although I'm not always a huge sci-fi fan, I do really enjoy a good space novel, so One Way really fit that bill for me. I've been thinking of this book as a 'And Then There Were None in space,' and that in itself is a good enough description to hook me. The author, S.J. Morden, is a "bone fide rocket scientist" and for me that really gave this book an additional sense of authenticity that made it all the more enjoyable for me. 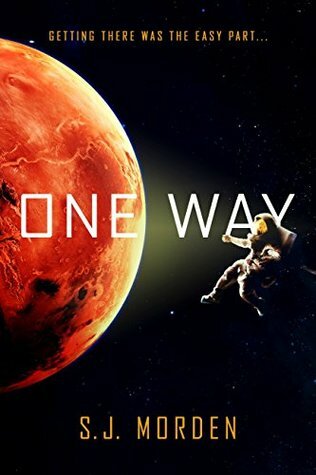 One Way kicks off when a small crew of ex-cons are recruited to be the first men to set up base on Mars. When a few of the crew members begin dying at random, the deaths that initially appear to be accidents soon start adding up to look a bit more suspicious than initially thought. As you can imagine, the number of suspects is limited and tensions start to rise. The beginning of this book was a little on the slow side, but that's only because of the setup that had to be done to really get the foundation settled and the story and going. It was never boring, but it did leave me wondering if it would pick up--and fortunately it did. By the time I reached the midway point of this book, it was a complete page-turner and I was having a hard time putting this book down at all. There were a few times when the technical aspects of things took over a bit too much for me and I would sort of skim over the more intricate aspects, but that didn't happen too much to really be a problem. At the end of the day, I'd probably rather have too many details than not enough, anyway. I really liked the cast of characters that was collected for the crew. They weren't all entirely likable, but they all had a certain authenticity that worked really for the story and helped to tell their own personal backstories. It was hard to keep track of who was who initially, but eventually the personalities of each began to show through and things got smoother. Our main protagonist, Frank, often came across as a fairly generic sort of figure, but I actually thought this worked well in coordination with the other characters, as it basically made him the de facto leader, as it seemed it was most natural and that he was the most clear-headed at all times. Despite his murder conviction, Frank seems to be a fairly decent guy (who ever thought those words would be typed?) One Way has a theme of 'second chance' running through it that I think every character could relate to in some way, and that I'm sure many of us reader could also relate to. I did want a little bit more from each of the characters in terms of fully developing the into three dimensional figures, particularly when it comes to a man named Brack. The characters were still well done, but I just felt like the development wasn't quite there. One Way wasn't perfect and there were more than a few things that I could have done without, such as placing some sort of classified document at the beginning of each chapter that documents conversations and dialogue between the creators of the company that sends the crew to Mars. Some of these were really interesting and did add a lot to the story, but more than a few felt a bit unneeded and were overall uninteresting. One Way ends on a bit of a cliffhanger in the sense we find out what's been going and why people have been dying, but it still leaves off right at a point where I cannot way to find out what happens next. I really can't wait to read the sequel! Overall, I've given One Way four stars. This isn't some phenomenal, ground-breaking book, but it is incredibly fascinating and highly entertaining nonetheless. I simply did not want to put it down. Morden himself is a retired rocket scientist, which lends quite a lot of credibility to the technical aspects within this book.